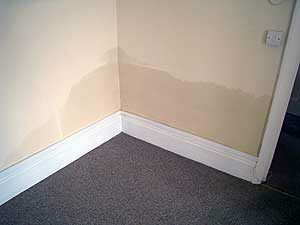 One of the most common tell tale signs are tide marks left on walls. Tide marks are caused by evaporation and salts from the ground. You will normally notice them anywhere up to a 1 metre above the skirting board. If you do not notice tide marks, another very common tell tale sign is damp patches or staining. Typically, these damp patches are yellowish or brownish in colour and similar to tide marks, you will notice them up to 1 metre above the skirting board. Salts in the form of white fluffy desposits in the plaster similar to the images below are another clear tell tale sign. These salts are washed out of your bricks and into your plaster leaving what can look like blistering patches on your walls. 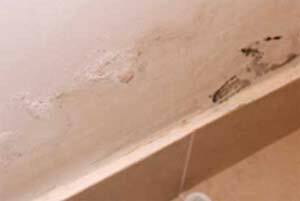 If you see black mould appearing above your skirting board it is a clear sign that there is some form of dampness affecting the area, especially if you have no other evidence of black mould within the property and the black mould is localised from the skirting board to up to 1 metre above the skirting. It is also important to note that rising damp only occurs on ground floor levels as it is moisture from the soil that is being drawn up the walls and thus causing the rising damp problem. If it is the case that your damp problem is on the first floor or above, it may be that you have a condensation problem or a penetrating damp issue.